November is here and for U.S. Americans that means Thanksgiving is coming! For music teachers this time of year often gets swallowed up with winter holiday music, as we get our students ready for their performances, but sometimes it's nice to throw in a turkey song or two to keep ourselves from losing our minds! 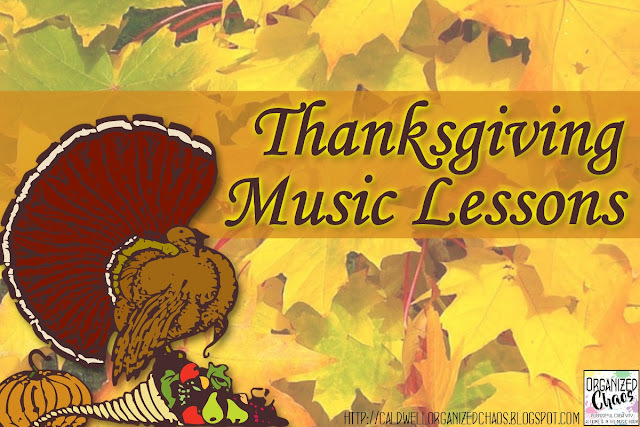 Here are a few Thanksgiving-related music lessons I like to use in my elementary general music classes. To be honest, I don't incorporate seasonal / holiday-related material in my music lessons as often as many of my colleagues. I'm more focused on skills and concepts that I want to teach, and if I happen to have seasonal material that will teach those skills, great, if not, oh well (read about how I plan by skill/concept in this blog post, and get my K-6 lesson plans for November here). With that said, I have come across a few Thanksgiving songs that I have enjoyed using with my younger students especially (and fit in with the skills I want to teach) that I wanted to highlight today. This is a great song for practicing steady beat and sol-mi singing and notation. I have students sing the song while walking around like a turkey (interpret that as bizarrely or literally as you want!) on the steady beat. I also use it to discuss the higher and lower notes in the song, identify them as sol and mi, and practice singing parts of the song on solfege and/or using Curwen hand signs. My first graders notate the first line on the staff using manipulatives (see this post for what I use)- it's a great way to practice notation since it has an easily identifiable melodic pattern. Find the song here. This is a great one for Kindergarten classes with hesitant singers / generally shy performers. First we all sing the song together with hand motions, then I sing the song and have the students all sing just the parts that the turkeys say together. Once they know the song really well, I pick 5 students to stand in a line and assign them each to one turkey part, and they say their "line" by themselves, with the 5 of them singing the last line together. I start with the class clowns and make sure to get the silliest kid to be the one that says "I wanna get fat" and really ham it up- once we're all laughing the other students are much more likely to do their own part. I find this is a good time of year to try to push those shy students a little- they've had enough time to get comfortable with me and with their classmates, but it hasn't been long enough to build up anxiety about performing. Hear a recording of the song here. I actually do the majority of my Native American music in the spring as a focused study of Native American music/culture with Kindergarten, but this is a great time of year to incorporate some of these songs as well. I wrote a whole blog post on my favorite songs and activities to use with Native American music- you can find that post here. What are your favorite Thanksgiving songs and activities to use in your music classes? Or do you even bother teaching anything Thanksgiving-related? I'd love to hear what you do in the comments below! You can see all of my lesson plans and get all of the materials to teach them in my November curriculum. Want more? Subscribe right here to the Organized Chaos newsletter and get ideas and resources sent straight to your inbox! Would you be willing to share the boomwhacker chart?